About a month ago I started going back to the Mormon church. I had been missing it lately. I like being back. I know it’s where I need to be. From now on you’ll see Mormon related posts. I’ll still post about other things so don’t worry. I’ll still keep some Pagan practices as well. I’m actually doing a 90 day Book of Mormon challenge on my Instagram if you want to join in. My IG is @ldsgingerasrai. I don’t think I ever updated you on my thyroid levels. I went to my general physician and Endocrinologist and they both told me that my levels are normal! That’s awesome news. I still notice symptoms from my Hashimotos, but I have a lot more good days then bad days now. I really think that it was my Graves medication (Methimozole) that kept me sick. My new Endo said that my old Endo was over medicating me. She took me off my meds at the beginning of the year and ever since then I have slowly started feeling better. I still haven’t gone back to doing Whole 30, but I’m really trying. When you’re on it you have to cook every meal. But that’s been hard because I don’t have the energy most days. I know that if I go back on that I will have energy. It’s a vicious cycle. I also need to plan my meals better, that’s a huge part of it. I’ll get back to it though. I really want to start taking care of myself. I want to keep my thyroid levels normal and get my Hashimotos under control. I have signed up at Planet Fitness 3 weeks ago. I really enjoy going (when I have the energy). I try to go even when i don’t have the energy, but some days it’s really bad. I did good the first week, but these past two weeks I’ve only been a few times. I’m still losing weight most days. I’ve lost a total of 24 pounds! My sister has been on her mission for a month now. Only 17 months left! I miss her so much, but she is doing the Lord’s work. She’s really enjoying it. I knew she would, she’s a great missionary. On July 30th, my nephew Carter turned 3. I can’t believe how big he is getting! He’s such a character. Health– Well I didn’t get as far as I wanted to with my health goals this week. I only did strength training one day, I didn’t walk at all, and I still couldn’t get to sleep before 4am. I also had too many “reintroduction” days. I at least I know for sure which foods I can and can’t have now. I did however get blood work done at my doctor’s. I don’t go back for a review until July 5th. Spirituality-I still didn’t meditate. It’s hard for me to actually mediate on little to no sleep. Work-I worked as many hours as I could and did some much needed advertising. Art-I finished painting all but one of my mini altar sets. Now all I have to do is make the pouches and they’ll be ready to list on Etsy. Health– Work on the goals I didn’t accomplish last week. 1. Strength training 3 days a week. 2. Walk 3 days a week. 3. Get to bed before 12am. 4. No reintroduction days. They just make me sick. Spirituality-Actually meditate instead of just talking about it. 2. Add complimentary water and beverages. Art– Pouches for the altar kits and get them listed. Blog-Now that it’s kind of slowing down at work, I want to start writing more articles/posts pertaining to Paganism and Witchcraft. I feel like I don’t have enough in here. I want to write them geared more towards beginners like myself. It’ll help me learn too. I’ll be posting which topics I plan to cover later this week. Yesterday marked Day 30 of my Whole 30 diet. I’m so supposed at myself that I made it this far. Usually when I start a new diet I give up as soon as I’m hungry. Or if I do “stick with it” and have cheat days. Not this time! I stayed pure the entire 30 days! It was really hard and I wanted to give up most days. Instead, I kept at it and I’m so glad I did. In the book it says if you cheat you have to stay over. The reason is because this is the cleansing period. Your immune system reboot. I definitely didn’t want to start over. -Down 6.75 inches (all over. 2.5 just in my waist). -Even though I’ve had more energy, done of my spurts come late at night when I go to bed. Causing me top not even get tired until 3 or 4am. -Being hungry late at night and not wanting (due to poor meal planning) and having to cook a late night meal. Not being able to just grab a snack. -my chronic pain isn’t completely gone and still keeps me up. Now don’t let you discourage you from doing the Whole 30 if you were planning on it. I already had insomnia prior to starting. But I’ve come with a couple solutions. -Go for a walk during the day. Hopefully this will burn out most of my energy and I’ll sleep nicely tonight. I already did this one today. 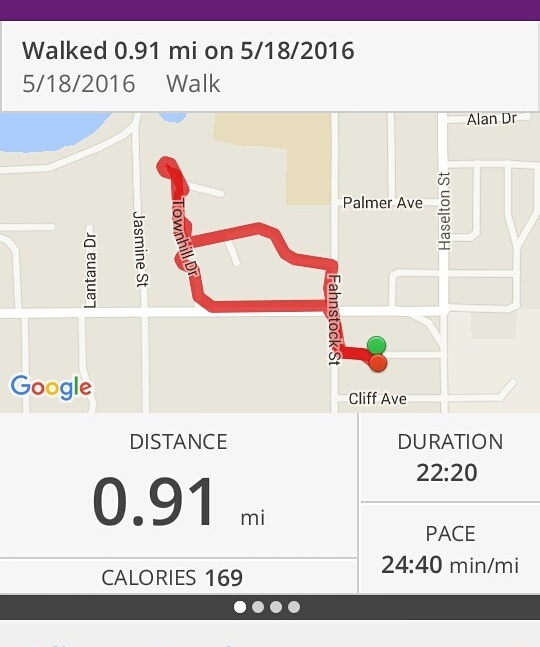 Almost a mile. This was my first time exercising in a very long time. -Eat more protein or good fats close to bedtime so I’m not hungry. -Journal more. When my late night energy kicks in, my mind usually goes on over drive and I can’t shut it up. It’s also when I get my best ideas. If I wrote everything down, I’ll hopefully be able to go to sleep sooner. -Stop using my phone an hour before. I think most of us are guilty of this one. I’ll be on FB while laying in bed. These are just a few things I came up with to help me get better sleep. Hopefully they work. We’ll see. Even though I’ve completed day 30, it’s not over yet. Now cones the reintroduction period. I’ve only decide to reintroduce honey, beans, and rice. Today is rice. So far no problems. I’ll eat rice in my diet for two days, then go back to Whole 30 for 2 days. If it doesn’t make me sick, I’ll keep it in and go on to the next food. If it does make me sick then obviously I’ll cut it for good. After I’ve tried all three foods again, I’ll stick with this eating Whole 30. Like I mentioned in my other post, it’s a lifestyle change. I can’t/won’t go back to bring sick and in pain. I’ve already spent 3 1/2 years doing that. I’m done. On to the next chapter in my life!